Hiroi-sensei has appeared many times in Japanese newspapers. Below is a translation of an article entitled “Looking Forward to the Creation of “Akiu Products” that ran April 20, 2004 in the newspaper Kahoku shinpō. See the original Japanese article at the link below. 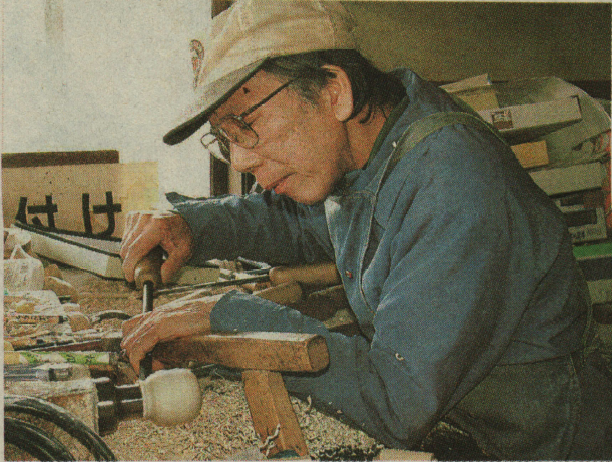 Hiroi Michiaki makes kokeshi at Akiu Craft Village. He hopes to create a kokeshi forest. In an attempt to promote the local woodworking industry, Sendai City is embarking on a “kokeshi forest”-making project in the town of Akiu’s Taihaku ward. In collaboration with Akiu Craft Village, painted maple and dogwood saplings will be planted; those trees will become the pulpwood for traditional craft goods. Their aim is to eventually have kokeshi that are entirely made from “Akiu Products,” and to facilitate that, a planting event, for which city residents can volunteer, is planned for May 5  . Dogwood trees are native to the Akiu area, but the region is very marshy, making logging work very difficult. Because of this, Hiroi Michiaki (age 70), an artisan of Akiu Craft Village who makes kokeshi, is supplied with woodchips made by the lumber workers of Miyagi Prefecture’s Kunomori Ward for his work. However, for a number of years lumber imports have been increasing and the amount of woodchip production has gone down; dogwood preservation, too, is becoming more difficult. Planning the pulpwood through their own supply efforts, Sendai and Akiu began the “kokeshi forest” project in May of last year. The city-owned forests near the Craft Village are roughly 6 hectares, and they plan to plant about 10,000 saplings over the course of 6 years, finishing in 2008. In one year, they have planted 1,400 dogwood trees. It’s projected it will take roughly 15 to 20 years for the trees to grow into usable materials, but Hiroi-san has said, “If the next generation of artisans is able to use local dogwood to make kokeshi and other goods, I would be happy,” and is watching over the saplings affectionately. The planting event, sponsored by the joint Sendai and Craft Village project, will be held on the 5th and is recruiting volunteers to help the artisans plant 1,500 saplings in the city-owned forest area. They also plan to hold cultural exchange events, with woodworking workshops and atelier tours. There are 100 volunteer positions available on a first come, first serve basis. To volunteer, contact the Sendai City Agriculture, Forestry, and Public Works Division’s Forestry Branch at 020 (214) 8264.